They might be called “boiler room scams”, but one of the biggest examples of organized investment fraud in the UK took place inside an office building in east London. Back in March 2014, staff from the UK’s financial watchdog launched a search operation at the Docklands Business Centre. Several floors up, Jeannine Lewis, 50, was caught on CCTV sweeping up a stack of glossy brochures and standing on a table to remove a ceiling tile to store the documents in the roof. Minutes later, she did this again — though this time moving a large black computer system. According to the Financial Conduct Authority, Ms. Lewis was hiding evidence from authorities concerning a sprawling London-based boiler room scam that cost 170 unsuspecting victims a total of £2.8m. 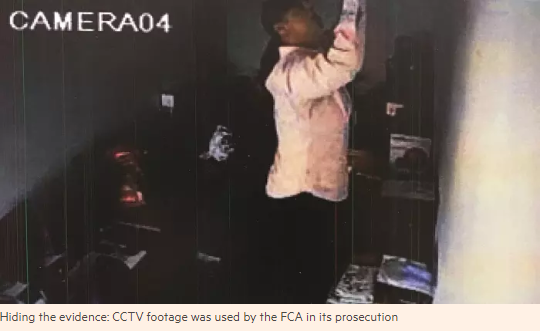 The FCA, which has now brought its second-largest criminal prosecution to date against Ms. Lewis and five others for the scam, had made an unannounced visit to the office, catching the defendants off guard. Ms. Lewis claimed at Southwark Crown Court that she had merely been adhering to her company’s clean desk policy. But the group has now been found guilty of charges including fraud, money laundering and perverting the course of justice. In a coup for a regulator keen to shake off accusations of being too “soft”, sentencing on Friday confirmed the defendants would be jailed for a total of nearly 29 years. Dubbed Operation Tidworth by the FCA, the case shines a harsh spotlight on the shady world of boiler rooms— unauthorized brokerages that use cold calling and other high-pressure sales tactics to push worthless or overpriced investments to members of the public. The court heard that the defendants set up five different boiler room operations between July 2010 and April 2014 to persuade people to invest in a company that owned land on the Portuguese island of Madeira. Investors were told the land — and therefore the company’s shares — would increase in value to give returns of as much as 228 percent, thanks to the proposed development of a prestigious golf course nearby. However, investors never saw their money again. Instead, it funded the lavish lifestyle of the group’s ringleader, former bouncer Michael Nascimento. According to prosecutors, the 41-year-old spent £23,000 on VIP Arsenal football club season tickets and £46,000 a year renting a six-bedroom property. Mr. Nascimento was portrayed by prosecutors as paranoid and controlling. Ironically, it was he who installed the CCTV cameras — that captured Ms. Lewis, his personal assistant, stowing away the documents and computer hardware — in order to secretly monitor his staff. On Friday, he was the last of the group to be sentenced, receiving 11 years. On the same day, he and his chief salesman Charanjit Sandhu, 28, were also sentenced in another case involving the mis-selling of £2.4m of carbon credits to 130 victims. Here, the court heard, the proceeds were used to buy items such as an Aston Martin and a Rolex. At an earlier hearing, the court found the defendants guilty of offenses of conspiracy to defraud, fraud, money laundering and perverting the course of justice, as well as breaches of markets legislation. Charanjit Sandhu was sentenced to five and a half years’ imprisonment. Hugh Edwards, 36, and Stuart Rea, 50, who both recruited sales brokers, were sentenced to three years and nine months each. Jeannine Lewis, Mr. Nascimento’s personal assistant, received two and a half years while Ryan Parker, 25, described as the “office dogsbody”, was jailed for two years. Operation Tidworth has been presented as a win for the FCA, which has recently sought to flex its muscles as an investigator and prosecutor of financial crime. As part of its prosecution, the watchdog seized more than 100 computers, trawled through 4m documents and analyzed 65 bank accounts — both in the UK and overseas. In terms of the amount of evidence sifted through by investigators, the case comes second only to the sprawling insider dealer case named Operation Tabernula. Indeed, Mr. Nascimento and his associates went to great lengths to deceive their victims. In convincing investment brochures seized by the FCA, one of the boiler room companies boasted of being “one of the UK’s largest wealth advisory firms”. Documents were forged under the name of the Four Seasons and Hilton Hotels to con investors into thinking the hotel chains were interested in buying the Madeira development. Website content was copied from banks such as Commerzbank and Citibank. One investor was even flown with his wife to Madeira to meet Mr. Nascimento and Mr. Sandhu who were using fake names. The couple were shown land that was not the land they were said to be investing in. The investor, who lost about £923,000, told the court that he felt like he had been “a fool” and would have to “live with that for the rest of [his] life”. Hannah Laming, a partner at law firm Peters & Peters with a focus on business crime, said: “There’s been a lot of focus on insider dealings and the headline fines that you get from banks. But I think it’s important for [the FCA] to focus on cases like this. The people who’ve lost the money — it’s their life savings.” Still, questions have been raised as to how the same perpetrators were able to continue to operate over a four-year period, reinventing themselves even after the FCA was made aware of the first iteration of a boiler room operation involving Mr. Nascimento in 2011. Mark Steward, the FCA’s director of enforcement and market oversight, said this was because Mr. Nascimento used numerous tactics to avoid detection. “He deliberately hid his identity, used other people like the directors and signatories on the bank accounts, [and] avoided having his name on any documentation,” he said. Others urge more transparency around what happens when the public, or businesses, report these types of scams and fraud. One expert in the sector, who did not wish to be named, said that it was unclear how the FCA handled complaints. “It would be good to know what they do with these sorts of reports from the public and how they pursue them,” the expert said. Regulators will be hoping that the publicity surrounding the case will open the eyes and ears of more unsuspecting investors, and give them the confidence to hang up on any cold callers who are offering a seemingly hot deal. Copyright The Financial Times Limited 2018. All rights reserved. Why Do Ordinary People Commit Acts of Espionage?